A hallmark of the Department of Music is that its students can broaden their horizons to encompass not only Western expressions of classical, jazz and contemporary music, but the music of other cultures. The department is well served in this by an outstanding faculty that includes nationally and internationally recognized experts in musical theater, popular music, early music, and women composers. Faculty expertise ranges widely from Handel's operas to rock 'n' roll, from the music of black Americans to Kurt Weill, from 12-century composer Hildegard of Bingen to the evolution of popular music in Zimbabwe. At Rochester, students also have opportunities to participate in performing ensembles. Some 400 students play or sing in a dozen musical organizations. Auditions for all of these groups take place during the first week of school. The department, though separate from the Eastman School of Music in downtown Rochester, maintains close ties with Eastman. Courses offered at the Eastman School, normally open to any student presenting the proper prerequisites, augment the range and depth of musical experiences and courses available to students in Arts, Sciences, and Engineering. 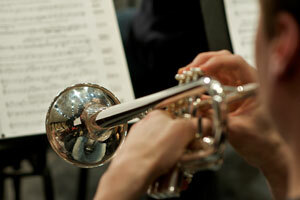 Our students can also audition to take applied music lessons at Eastman. They have access not only to the resources of the Art and Music Library on the River Campus, but also to the extensive collection in the Sibley Music Library at Eastman. In addition to a BA degree in music, the department offers a music minor, eight music clusters, and a number of performing ensembles comprising music majors as well as non-majors. In addition to our ensembles and programs, students who want to immerse themselves in music can join the music interest floor, an on-campus housing option that brings together undergraduates who love to listen to, play, compose, or perform music.